If your looking for some activities for toddler fun, then this is just the list you need when it comes to entertaining toddlers. These activities will show you how to keep a toddler entertained, whether you’re wondering how to keep a 1 year old busy, how to keep a 2 year old from climbing EVERYTHING or how to keep a 3 year old occupied. Toddlers are busy! I don’t know how they can go and go and seemingly never be tired, but I guess if we were learning to do new things everyday, we would be just as energetic and enthusiastic and utterly exhausting. See Amazon’s Top Products That Keep Kids Active. Coming up with ideas to entertain toddlers everyday can be exhausting. You might need this list because you simply need a mom break from the constant-ness that is raising a toddler. 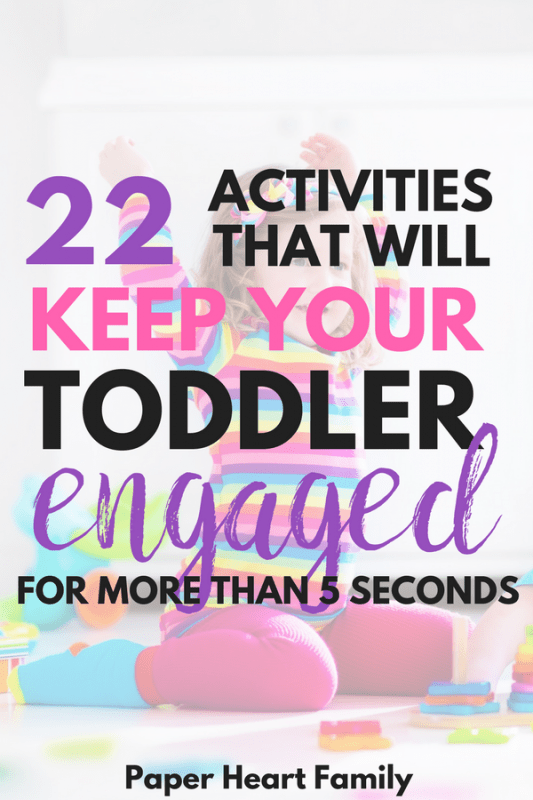 These activities to keep a toddler entertained should help. They are guaranteed to engage your toddler, to entertain your toddler at home and keep your toddler busy for a long time. Many of them are educational activities, too. 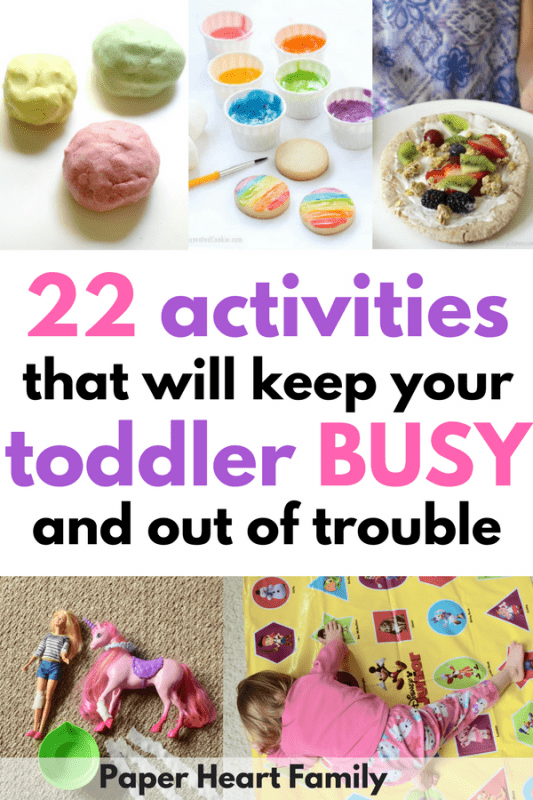 And if you’re looking for activities to do with your toddler, I’ve got those, too. For 7 days, you get fun, unique and simple (no-prep!) activities to get your toddler moving and active sent to your inbox. Letter crafts keep my toddler busy for a long time. I love these letter crafts because they are printable and I don’t have to find supplies like googly eyes and pink construction paper. You simply print and craft! Duck, Duck, Goose is a big hit with my toddler. She asks to play it all the time. We do it a little differently to make it more fun and engaging. Instead of saying “duck, duck” we say silly things like “dragon tacos” and “blueberry pizza”. It’s so fun to see what silly words and phrases my 2 year old comes up with. Your toddler probably won’t completely understand the rules to this classic game, but it doesn’t matter. It’s sure to elicit lots of giggles. Toddlers love stacking and you should love it to because it’s great for developing hand/eye coordination. Blocks and stacking toys are great, but simple plastic cups work great, too. My kids are obsessed with these oversized cardboard blocks from Melissa and Doug. We’ve had them for months and they still get tons of play (and are in great condition). Toddlers are the best little helpers ever. Well, except for the fact that they don’t really HELP. But they try really hard to, and that’s almost as good. Why can’t this toddler trait last forever? Anyway, if you need to mop the floor, hand your toddler a spray bottle and a rag. If you need to dust, put a fuzzy sock over your toddler’s hand and let her go to town. My toddler also LOVES cleaning the tub (also with a spray bottle of water and a rag). Victoria from the Modern Homestead Mama has this awesome Jello Dig activity (which is just what it sounds like!). Just make sure to set your toddler up on a giant plastic tablecloth (or better yet outside!) because we want your child to stay busy so that you can get stuff done. Having to clean up afterward would kind of defeat the purpose. Spin art is so much fun for all ages, but my toddler could literally do this for hours if I let her. And if you don’t have a spin art machine, you could use an unused salad spinner. Find out how to do Salad Spinner Art. Play Doh is another activity that never, ever fails. I love giving my kids some real kitchen utensils to use with their play doh (think measuring cups, spatulas, a potato masher). 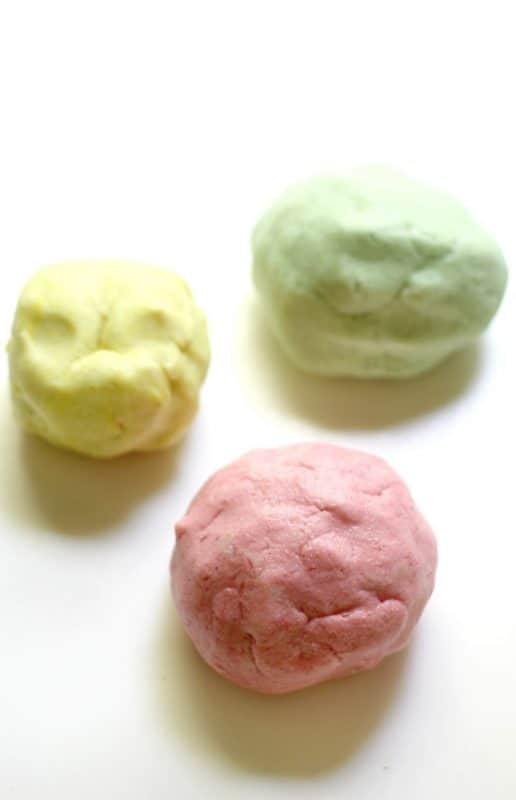 And you could make the activity last even longer by first making some of your own DIY play doh. You may not think of Twister as a toddler game, but it can teach your toddler so much. 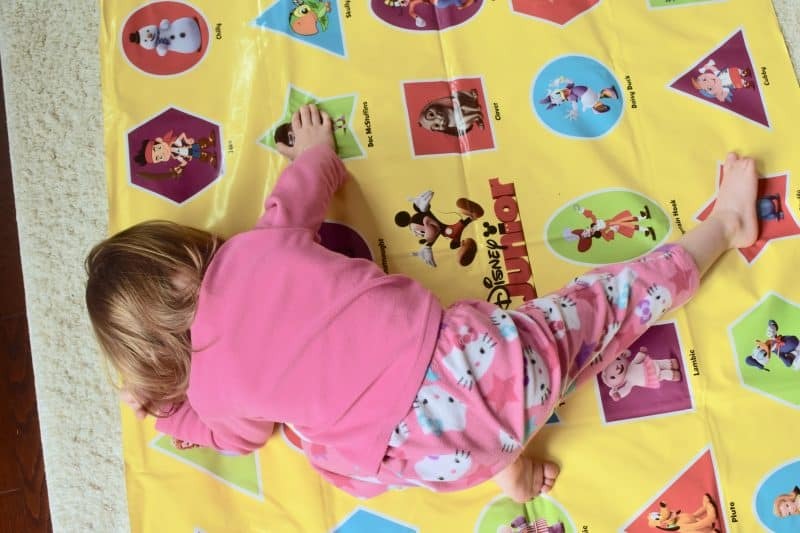 We love the Disney Jr. Super Stretchy game, which is a toddler version of Twister. My 2 year old is completely obsessed and we play every single day. It also keeps her active, and reinforces body parts, colors and shapes. Discover more of my recommended best board games for toddlers. 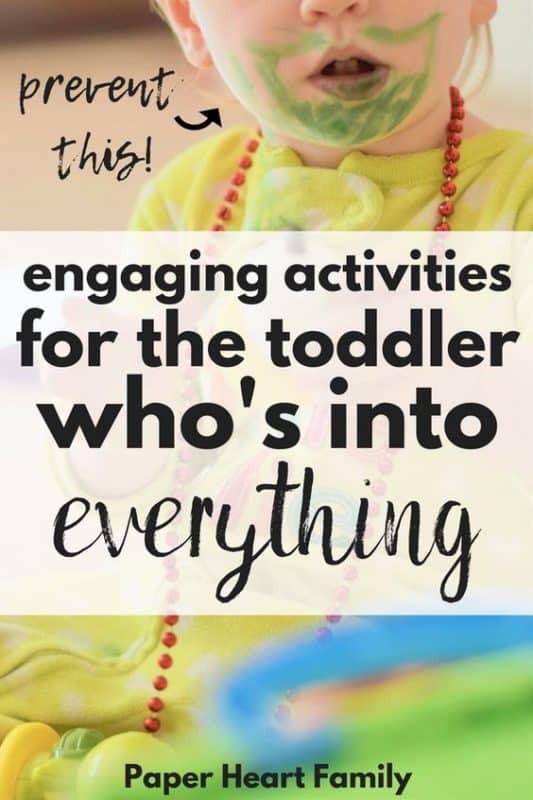 This activity is perfect for toddlers because they are so small. Simply take two hula hoops and join them together (like a sphere). Have your toddler try to crawl through it without touching the hoops. If your toddler likes reading, then there’s nothing more beneficial than reading to your child. The Book With No Pictures- I adore this book because it’s 100% engaging (even to toddlers!) without having any photos. It’s also interactive and prompts your child to answer questions along the way. Your toddler will love it because it will make YOU say some pretty funny stuff. Click here to look inside this book. The Very Hungry Caterpillar– You can’t go wrong with Eric Carle. Click here to look inside this book. Mother Bruce- This is a book sure to give your toddler the giggles. It’s about a bear who loves to eat eggs. One day, he collects some goose eggs to eat, which end up hatching. They call him “mama” and follow him wherever he goes. Click here to look inside this book. And if your toddler’s just not into books yet, pull them out and read to her when she’s playing. My second child couldn’t sit still long enough to read a book until she was 18 months old. At that point, she went from hating to read to being obsessed. Just keep trying! First Look and Find books are awesome activities to hold a toddler’s attention, but they are also great for cognitive development. My daughter actually made up this activity, and I must say, it’s pretty brilliant. 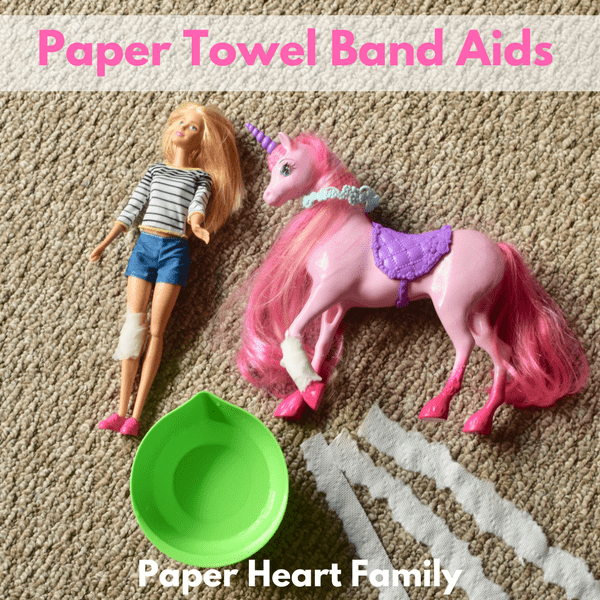 Kids are OBSESSED with band aids, and while my kids would love it if they had an endless supply of band aids at their disposal, band aids are EXPENSIVE. And these are actually just as cool. Just rip paper towels into strips, fill a bowl full of water, dip and wrap the paper towels like band aids. Genius, right? Hide and Seek is another classic game that never gets old (unless you’re a mom playing it with your kid). In our house, we also like to hide objects. If your toddler is a little older and is starting with number or letter recognition, it’s a great idea to hide foam letters and numbers to have your toddler find and identify. Put a cardboard box out on your living room floor, throw some markers in it, and watch your toddler’s imagination come alive. Keep a designated kitchen cabinet unlocked for your toddler. Fill it with safe kitchen items, like bowls filled with dry pasta, Tupperware, measuring cups, etc. Make sure to get your toddler a durable wooden play kitchen that will get serious play for YEARS. Some of my fondest memories of my childhood include playing in water. My grandmother (who literally had NO toys in her house), used to set me up at the kitchen sink with a sink full of soapy water and an old-fashioned hand-crank egg beater. Kids love water! Set your toddler up with some toys at the sink with a toddler safe stool. Or put your toddler in the bathtub just to play around. My kids also like to put water in the sink of their play kitchen sometimes. Creating a pouring station is also a great water play idea that will keep your toddler busy. In the winter, get your toddler outside and create a fun and simple obstacle course in the snow. For some reason, painting is simply more fun than coloring (at least in my house). When I set my toddler up with paint, I can always expect her to be occupied for a while. 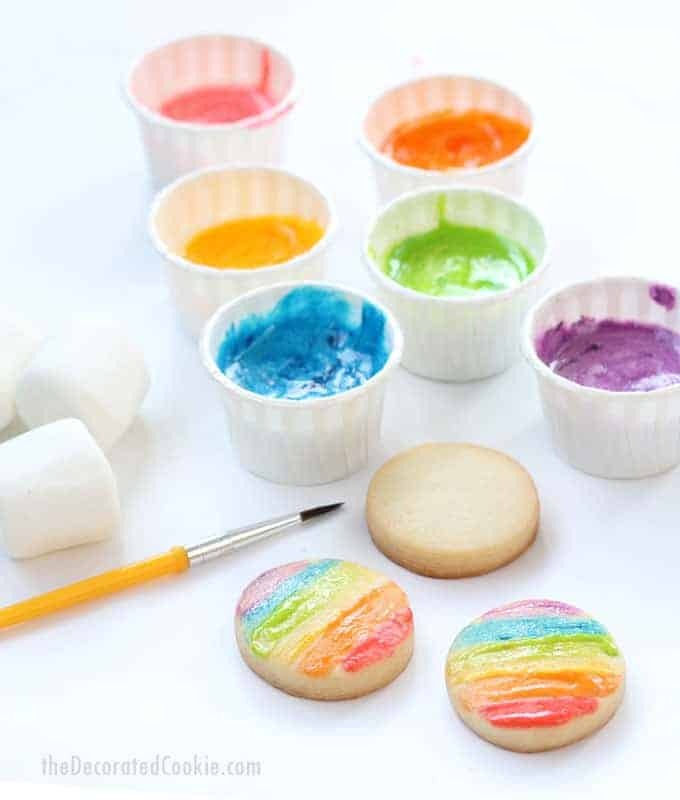 I love this edible marshmallow paint (doesn’t that just sound… oddly delicious? This way your toddler will be occupied helping to make the paint, then using it! If you have a leftover plastic tablecloth from a party, cut it into strips while keeping the top strip in tact, then hang it from a doorway. Your toddler will have a blast running through the streamers. Legos are such a timeless toy, and the great thing about them is that every kid in the whole wide world (okay, maybe I don’t have those stats, but it’s likely) loves Legos. We love combining Legos with other toys such as our Magic Tracks. Chances are that your toddler loves to bake, but it’s also possible that you never bake with your toddler. Because holy crap, baking with a toddler is possibly one of the most stressful activities. I’m getting anxious just talking about it. I suggest taking a deep breath, and just enjoying the process. Sip a little wine if you have to. With the right mindset, baking with your toddler can actually be a lot of fun. 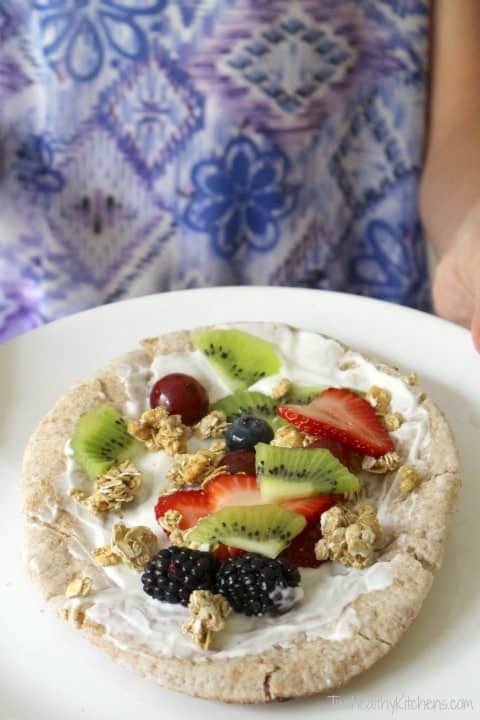 Don’t these No-Bake Fruit Pizzas look like the perfect toddler friendly recipe? When my toddler is causing trouble, sometimes I simply redirect her by asking her to cook me something. This usually turns into a marathon of play kitchen cooking. Make it more fun by including a cash register and some real coins. PS- Have you seen the new Melissa And Doug Freestanding Grocery Store?! *Insert surprised emoji face*. If I had this toy when I was a kid, I would never have played with anything else. Give your toddler some safety scissors and paper (or a magazine) and let her free cut. When she’s done, give her a big paper to glue her cut paper on. You can also help her fine tune her scissor skills. This scissor skills activity pad is perfect for developing those fine-motor skills. 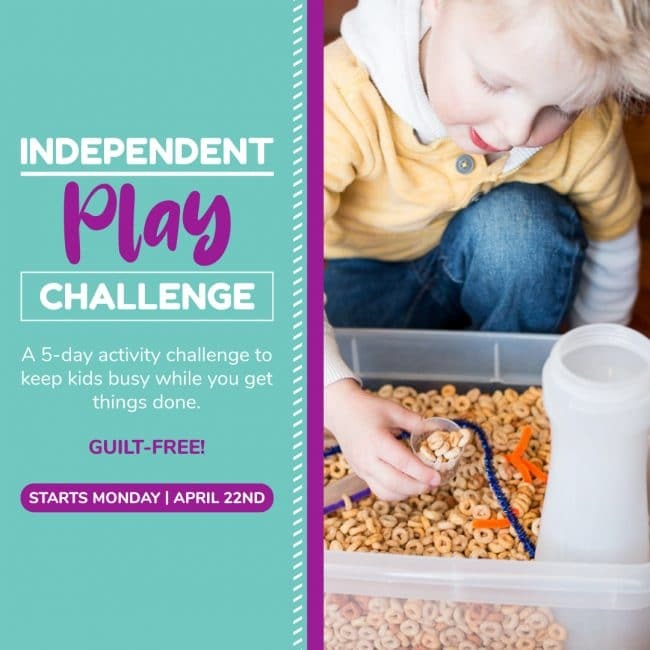 Now go use these activities to keep your toddler entertained and check out my other post of toddler activities that will tire your toddler out before bedtime. Thanks so much, Rachel! The toddler Twister is definitely a huge hit in our house, even with my 6 year old! These are great ideas! Thank you so much for sharing them. It’s always hard to keep a toddler entertained! Pinning this for future reference! It’s SO hard! And it’s not like they can just entertain themselves! So glad you found these toddler activities useful!